Two colleagues, or actually two friends, have started a new path. Each morning, the two friends study together, however, with time; Aaron Razel has discovered that his companion has composed many songs for the Shabbat. Yerachmiel Zeigler who is better known to his friends as ‘Rocky’ has played for Aaron a few songs ¬’Songs of the Shabbat’ from the recent time, and the two have decided to take on a way towards a new album. However, as time has passed, an absolute musical fact became clear: two are better than one. ‘Rocky’ has brought the music, Razel composed, designed and added a few pieces of music of his own, and the duets have accumulated into a full length album. There are fifteen songs planned for the album, ‘Raza De Shabbat’ andin Englidh ‘Secrets of the Shabboes’. As an opening to parts of the songs, the couple has added pensive thoughts regarding the songs of the Shabbat. Yerachmiel is a young (26) and talented composer who grew up in Muncie in New York City, where he also had studied in various yeshivas. He came to Israel on his own because of his love of the land of Israel. For him, it’s not his first attempt in music ¬two of his previous solo albums have received accolades. Today he performs with his band and they play Jewish rock on happy event and occasions. At the rest of the time, he accompanies the best of the Jewish music artists in Israel in singing and playing the guitar.The music is varied as well as the composition. 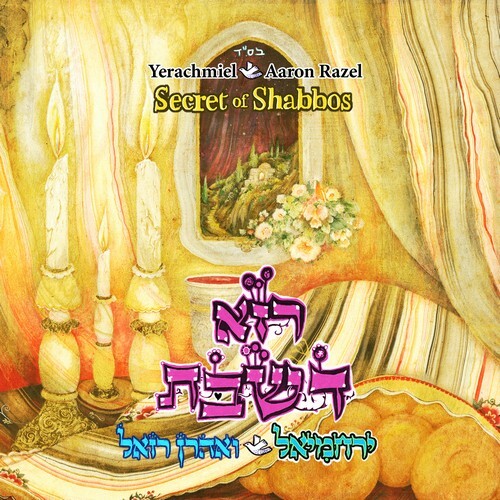 Razel has adjusted the composition to the charming character of Yerachmiel Zeigler. Aaron Razel celebrates in these ‘days a decade to his first album ‘The Burning Bush.